Mexican food is my happy place. In fact, I have yet to try a Mexican dish that I didn’t like, and the good things are that many Mexican food recipes can be petty easily adjusted to suit my Weight Watchers plan. This is great because I eat it ALL.THE.TIME. One of my favorite Mexican foods are enchiladas…..cheese enchiladas, chicken enchiladas, shredded beef enchiladas…you name it. I ADORE them. But when making them at home, I sometimes have an issue with rolling up those corn tortillas without having them break apart. I’ve tried a few tricks, and I can make it work, but it’s still a pain. So I decided to try doing some chicken enchiladas in casserole form and the result was AMAZING. Seriously, amigos. This dish is soooooo goooood. I actually just made these for dinner last night, and couldn’t wait to post them here on the blog for you to try! Feel free to top them with any extras you see fit…jalapeños, sour cream, diced red onions….whatever floats your boat. 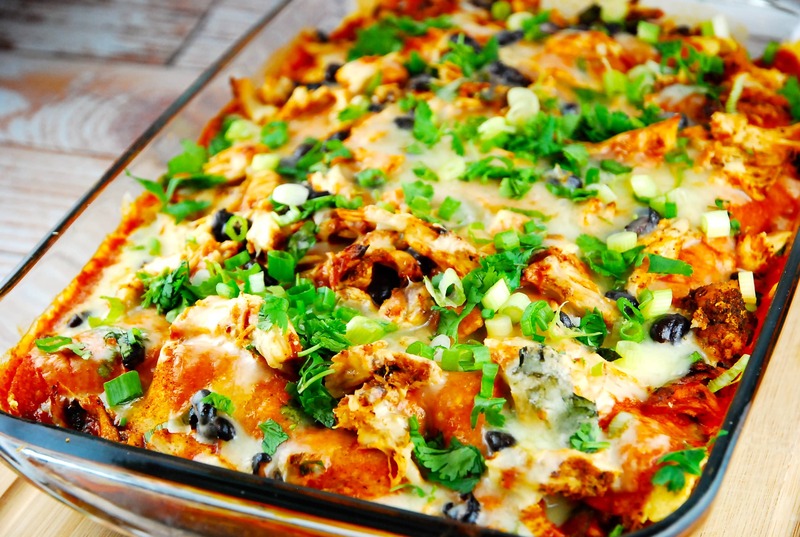 This Chicken Enchilada Casserole was loved by the whole family and I highly recommend you get in the kitchen and make this bambino ASAP. These stacked chicken enchiladas is a super easy recipe that is oh so delicious, and just 8 Smart Points! Family dinner is sure to be a hit with this dish. Preheat oven to 400 degrees.Fill a baking dish with 1/2 cup water. In a small bowl, mix together the garlic powder, chili powder, cumin, paprika, salt and pepper. Sprinkle generously over both sides of the chicken breasts, then place them in the baking dish. Roast chicken in oven for about 20-25 minutes, or until the chicken breasts are cooked through. Remove from oven, transfer chicken to a large bowl, and shred using two forks. Set aside. Reduce oven heat to 375. In a medium sized bowl, mix together the corn and black beans. To prepare the casserole, start by misting a 9 x 13 casserole dish with nonfat cooking spray or an olive oil mister. Add about 1/2 cup of enchilada sauce to the bottom of the casserole dish. Spread evenly with the back of a spoon. Top with a layer of 8 tortilla halves, so that the entire dish is covered. Now sprinkle about 1/3 of the black bean corn mixture on top of the tortillas. Follow with about 1 cup of shredded chicken, and then about 1/3 of the cheese. Top with a sprinkle of green onions and cilantro. For the second layer, start with 8 tortilla halves, then about 1 cup of enchilada sauce, then the black beans and corn, then the chicken, then these cheese, then green onions and cilantro. For the third layer, start with 8 tortilla halves, then the remainder of black beans and corn, then the remainder of the chicken, then the remainder of enchilada sauce, but reserve the cheese, cilantro and green onions. Cover and place in oven for about 20 minutes. Remove pan and take off the aluminum foil. Sprinkle the top of the enchiladas evenly with the remaining cheese, then return to the oven (uncovered) and bake for 10 minutes or until the cheese is melted. Remove pan, and top with the remaining green onions and cilantro. Let cool for about 5-10 minutes, then cut into 8 equal pieces. I am also frustrated because the print icon does not do anything. I have tried it in different browsers (Explorer and Chrome), to no avail. The best I can get is to click print, print preview and then adjust the size (anywhere from 60%-80% to get the complete recipe on page 2 on my computer, then print. Not ideal. Often the font is very small and the titles aren’t included. Please fix!! Aside from the printing, thank you for wonderful recipes that have basic nutrition outlined. Get the “Print Friendly” ext. from the Chrome store to add to your browser. It turns your page into a PDF that you can edit and then print. I tried this recipe & really like it. However, when I entered it into WW to log it, it’s actually 12 SmartPoints, not 8! Just a heads up to those of you also following Weight Watchers. I cut my casserole into 6, because 8 portions was so small that it wasn’t very filling. So, it was actually 15 points for me. Opps! Next time, I will put less cheese, less sauce, and add some veggies to bulk it up for fullness, but keep the points down. is this really 12 points??? I made this tonight and I found it salty. I can’t find the “PIN IT” button. I go to pinterest a lot for your recipes, but the “pin it’ button has been missing from recent recipes. I cannotmake the printable recipe print. It just tries and will not come up. Which size tortilla did you use? Why am I having such a difficult time printing these recipes? When I click on “print friendly”, I only get the first paragraph “Mexican food…”, but the recipe disappears. Am I doing something wrong? If I have a difficult time printing recipes, I just copy text and paste into word. Then, I can edit things that I changed in the recipe. I make a very similar casserole and luckily, our local grocery chain carries a pre-cooked, shredded chicken breast that is already seasoned. It’s the perfect thing to use in recipes like this. I usually use pinto beans in my recipe but I’m going to have to give the black beans a try. With a little dollop of low fat sour cream, you can’t go wrong!! Thanks for sharing this recipe! Looks great! Print thingy isn’t working. When I print recipes from you, the print from the right side margin gets imposed on the recipe print and makes it difficult to read. Do you know what I can do to stop this? Wow! Sounds delish. I know – right? I always have that same problem with the tortillas. But this will solve my problem. Can’t wait to try it. BUT – Your print friendly link doesn’t work – only give the picture and your comments – not the recipe itself. You really need to fix your print settings. I used to get the full recipe in the email and now I only get a picture and description. I have to follow the link to the blog for the recipe. That would be fine if the Printer Friendly button worked, but it doesn’t. The only way to cleanly print the recipe is to copy and paste it into Word, a step that’s kind of a pain to do. I’ve tried it in both Explorer and Chrome and it doesn’t work in either one. This sounds wonderful and I’d like to print it but the print friendly button only gives me the photo and description. Could someone fix that please? Thank you!